Rate-All-That-Apply (RATA) is a variation of the more widely used CATA question format. For a prespecified list of terms, consumers indicate whether they apply to a given product, and if they do so, to rate their intensity. For example, a 3-pt scale may be used with anchors ‘low’, ‘medium’ and ‘high’ or a 5-pt scale anchored at 1 = ‘slightly applicable’ and 5 = ‘very applicable.’ Given the hierarchical nature of the task and the non-normal distribution of the intensity data, it is not obvious how to analyze RATA data appropriately. In the present work we suggest interpreting RATA data as 4- or 6-point scales, considering a missing check for any attribute as a score of 0. Based on that, randomization tests were applied to investigate potential product differences. We show that the null distribution of these tests for RATA data coincides in practice with the one from classical parametric tests derived from an ANOVA context. Consequently, using the common F- and t-tests provides a valid and easy analysis of RATA data. 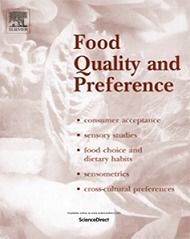 In four consumer studies, tests for product difference usually gave the same results when RATA data were analyzed with ANOVA and Cochran’s Q test. Graphical display of the data was found to be very similar based on Correspondence Analysis (CA) (treating RATA as CATA data) and Principal Component Analysis (PCA) (treating RATA as continuous data). Meyners, Michael, “On the analysis of Rate-All-That-Apply (RATA) data,” RIQUIM - Repositorio Institucional de la Facultad de Química - UdelaR, accessed April 22, 2019, http://riquim.fq.edu.uy/items/show/4001.